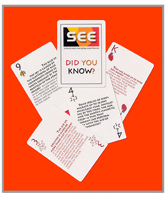 with our "DID YOU KNOW?" Leadership and professional development activities to both prepare and mobilize the members of the 800+ Delta Chapters to serve as life-long informal science education organizers for family and community science events or as parent money amulet educators. A science radio talk show, The Delta SEE Connection features African Americans in science, engineering and mathematics and highlights scientific research that is being conducted at private institutions and college campuses. Audio versions of these interviews along with brief written bios and photos of the scientists are available on the SEE Radio portion of this website. The interviews were also available for Black History Month through the SEE African Americans in Science, Technology, Engineering & Mathematics podcasts. Short interviews on Science Update, an award winning radio program produced by AAAS, in which scientists share information and results of research they have conducted. A web site offering resources to trainers and families. SEE leaders report community activities for evaluation. Partnership/alliance and dissemination activities include community outreach through training of volunteers in youth-oriented organizations such as the Links, Inc., Eastern Area; the Continental Society, DC Chapter, or providing youth field trips, parent education presentations at schools or exhibitions at the AAAS Family Science Day and Community Service events such as the DC Science, Technology, Engineering Mathematics (STEM) Summit. Our Partner: Essay Writing Service - WritePro.net . Been involved with Delta SEE for nine months or more? If so, please click here and complete a short follow-up survey! Done a Delta SEE event recently? If so, please click here and tell us what you did! Copyright 2004 by the American Association for the Advancement of Science. All rights reserved. This material is based upon work supported by the National Science Foundation under Grant #0104555.